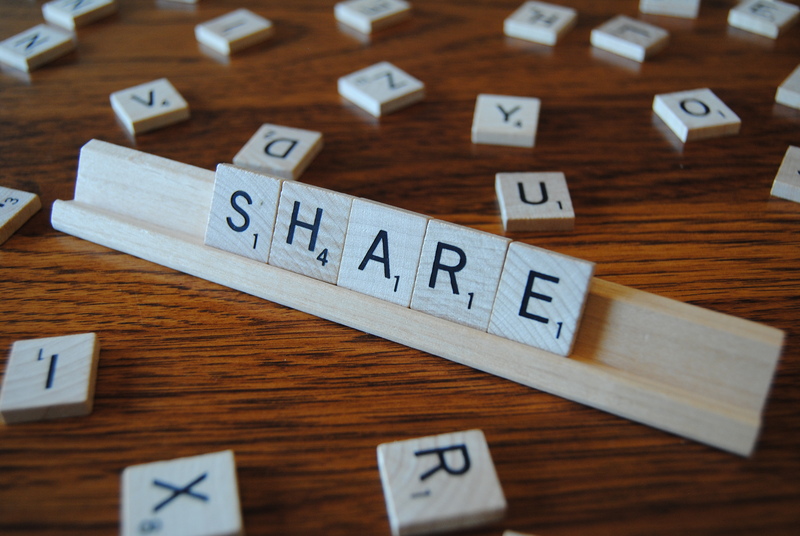 XMind Blog: How to share your mind maps? How to share your mind maps? We believe nothing is better than sharing your best mind maps with others. 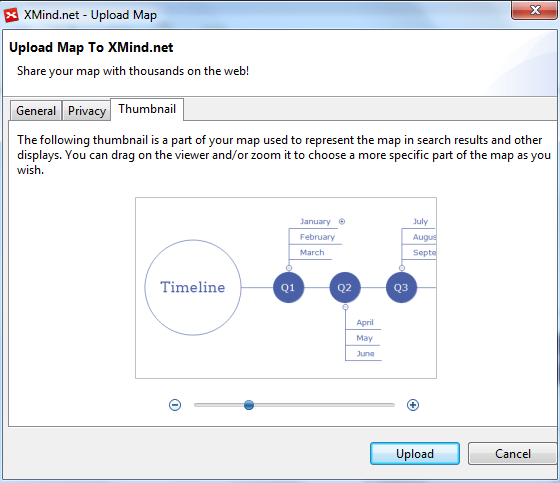 Now, you can simply use the “Share” feature to upload your maps into the XMind.net, local network or Biggerplate.com. Further, after uploading to XMind.net, one URL for your map will be generated and you can share the link to friends on social network. Our users have shared more than 110,000 creative mind maps in XMind Library. Join in the community by uploading your maps to “XMind.net”. Firstly, you have to launch XMind and open your maps. Secondly, on the toolbar, click “File”, select “Share”, “XMind.net”. Next, you can design a proper title and description for your maps and select from “Privacy” to public or not. Finally, adjust maps in Thumbnail and click “Upload” then done! If you want to share maps with other XMind users in the same local network, again, launch XMind and open your maps. Select “Local Network”from “Share” option, you can either choose to share with select user or share with everyone in the local network, just click “Upload” after you finish. 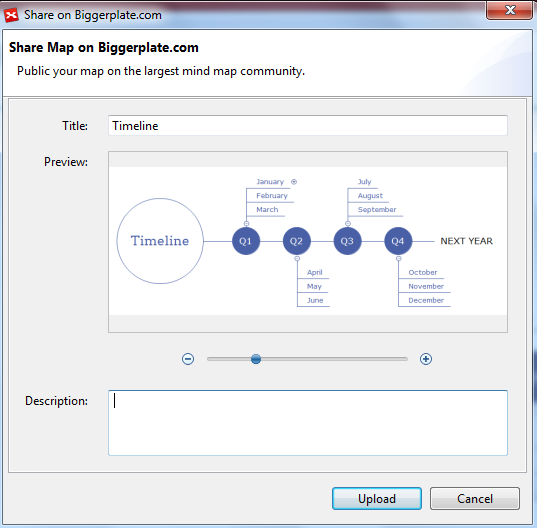 However, if you want to share maps to Biggerplate.com, the steps are easy too. Launch XMind, open your maps, select share to “Biggerplate”. Sign in your Biggerplate account and authorize XMind to access your account. Enter your title and description for your maps then upload. Is it simple and easy to do? Now, it’s your turn to make a try! Please do contact XMind support if you need any assistance. Good, but I expect xmind to support collaboration and sharing like google docs do. It would be easier to upload it into dropbox! When sharing a map to a local network, your instructions say “Upload” after you finish. However, I cannot find an Upload button or icon. Where will I find this? Also, do the people that I share this with have to have xMind open when I share? because I do not find their names listed . Is it possible to have a lighter version or with customizable installation? A little disappointed to find out that the ‘share’ is not possible from my own ‘XMind Cloud’. What I want, is to choose one of my mind map from ‘XMind Cloud’, generate a url, send that to my friend, and he/she could simply open it in browser to view the map without being a XMind user. Given that you already provide a nice work for viewing even editing in XMind Cloud, this should be not very hard to achieve. Come on guys, make that happen, please!!! I too would like to have a collaboration feature – like MindMeister. For some reason I like Xmind more because of its functionality. Please make collaboration happen. I’d love a feature that lets different XMind users access and edit the same cloud-based files, so Person A could create a new mind map, upload it to the shared cloud, Person B adds a couple of nodes to the map, Person C later checks off tasks that have already been completed, etc. 10,000 votes for google drive integration somehow. Please, why even if I can upload a xmind file onto Google Drive, through Locations, I cannot do viceversa to open and edit the file? Hi Claudio, if you are using Mac/iOS, iCloud is recommended to save the files.